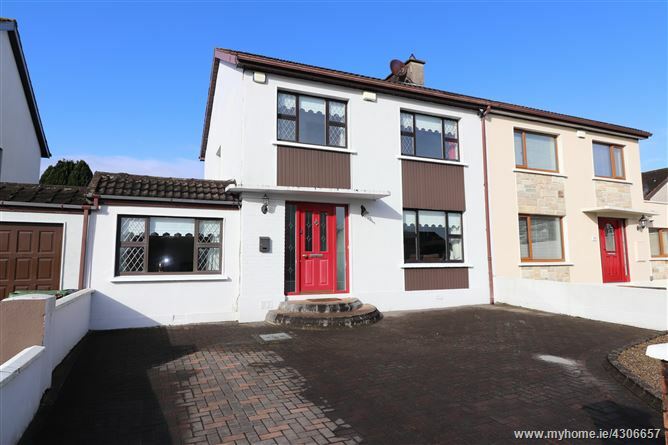 Rooney Auctioneers are delighted to present this superbly located 3/4 bedroom home located in the popular and established Richmond Park area of Corbally. It is excellently located being close to all local amenities, national and secondary schools, shops, restaurants and only a stones throw to the City Centre. The generous accommodation is approx. 140 sq/m (1,500 sq/ft) and is in excellent condition. It consists of an entrance hallway with composite front door, spacious kitchen-dining room with porcelain tiled floor and an abundance of cupboard space, a relaxing living room with a feature open fireplace, utility room which is plumbed for a washing machine and with additional storage, a large playroom, study/bedroom 4, downstairs wc, 3 double bedrooms upstairs and main bathroom. The house is tastefully decorated throughout. The rear garden boasts a decking area and a sandstone patio ideal for hosting summer barbeques. To the front there is a large cobblelock driveway with ample parking. Viewing of this super property is highly recommended. Entrance Hall: 4.32m x 2.30m With tiled floor, composite front door, carpeted stairs and landing, storage under stairs. Kitchen-Dining Room: Kitchen area: 4.95m x 2.80m. Dining area: 3.42m x 2.64m Beautifully fitted kitchen with ample cupboard and storage space, fridge freezer, electric oven & hob, integrated dishwasher, porcelain tiled floor, tiled backsplash, under cabinet lighting. Sliding doors opening onto decking area and patio. Double doors through to living room. Living Room: 4.76m x 3.88m. Bright and spacious living room with solid wood floor, feature open fireplace, coving and centre light fitting. Utility Room: 2.55m x 3.05m. Plumbed for washing machine, storage cabinets, roof light. Study/Bedroom 4: 4.22m x 2.55m. Double bedroom or study located off the utility with carpeted floor. Downstairs WC: 1.54m x 2.38m. Fully tiled, wc & whb. Playroom/Music Room: 6.43m x 2.17m. Large additional room overlooking garden, laminate floor.